All transactions are safe and secure with a reliable history in online purchasing behind each of our associates. 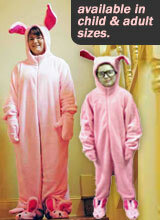 Buy the Ralphie Christmas Story Bunny Suit to own Christmas Story clothing and merchandise. Wear this Ralphie bunny suit Christmas Story costume overtop of your favorite Christmas Story t-shirt to celebrate the embarrassing pink bunny costume that Ralphie's Aunt Clara gives him for Christmas. The costume prompts Mr. Parker to comment, "He looks like a deranged Easter Bunny." Become the Pink Nightmare or get the similar Christmas Story t-shirt above with the movie logo appearing next to an image of Ralphie in his costume. After Mrs. Parker dresses Ralphie in the pink bunny suit, The Old Man surprises Ralphie with a Red Ryder BB Gun, citing that he once had one. In addition to the Ralphie Christmas Story Bunny Suit above, browse the Christmas Story Clothing Gallery for more apparel like men's and women's clothes, kids shirts or hoodies.